He was the icon of the early 60s, the greatest popularized president since FDR. We studied him in school, read about him in magazines and newspapers; and talked about his war experiences and heroism in the South Pacific aboard a small wooden fighting vessel known as PT-109. He seemed to be everywhere, personifying youth, vitality, and hope. He sent us on an adventure into space, an event that later defined the environmental movement. The last president to dare us to dream a national mission, his fervor put us on the moon, and instilled in us the spirit to reach outward even further. But it all came crashing down one day in late November 1963-forty years ago. I was in the old Barringer High School building changing classes, on my way to Mr. J. Harry Smith’s English class when the news of his shooting started spreading. I heard it in the stairwell. Upon arriving there, the class was quite unsettled; with Mr. Smith delayed in coming into the room—very unusual for one of my favorite teachers. When he did finally arrive, he had tears in his eyes, speaking very slowly and measured, informing us that what we had heard was indeed true. The president had been shot. Needless to say, not much was taught that period, and soon thereafter, we were dismissed for the day. Our usual group of friends met as always and headed back through Branch Brook Park toward Bloomfield Avenue, near where most of us lived. Something violent and very ugly had come into our lives. Our nation’s innocence was over in one brutal, senseless act. It was a quiet walk home; shocking to realize that presidents’ could still be assassinated. Little did we know what would be in store as events unfolded later that weekend, and for the remainder of the turbulent 60s. News coverage of the events was constant. Almost painful it was to watch TV, and listen to that somber death march, as the President’s coffin was wheeled through Washington on its way to Arlington National Cemetery. I went outside for a quick walk around the neighborhood, but there wasn’t a friend or other person in sight on that cold overcast afternoon. It was something out of a Rod Serling Twilight Zone episode; except this was real. I headed back for the warmth of home, and that ever present drumbeat. Years later, my wife and I visited Arlington and JFK’s gravesite. That old familiar gloom tried to descend again; but the absolute beauty and tranquility of that incredible cemetery helped keep the negative mood at bay. That place is as beautiful to me as the redwood forests of California. At the changing of the guard at the Tomb of the Unknown Soldier, there wasn’t a dry eye. It is the most fitting place for JFK to rest--among the heroes and fallen, a place where good, although at the expense of youth and unfulfilled promise, does triumph over evil. 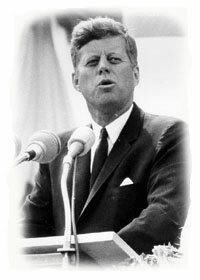 Whenever I think of JFK, I naturally remember old Barringer High, and J. Harry Smith who validated the event for me; with those tears in his eyes, and quiet soothing conversation to help us get through the confusion and fear. Mr. Smith passed a year or two ago, but I got to stay in touch with him over the years. I watched as he pioneered Essex County Community College and built it into a fine school. We invariably bumped into each other all over Essex County. He never failed to recognize me, always coming over for a warm embrace and some talk. I miss his smiling face and twinkling eyes, as much as I miss the innocence.